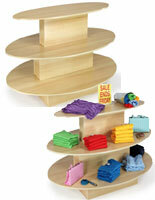 Similar to nesting tables, these tiered display tables offer a structured area for apparel items. 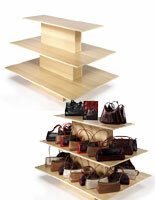 These fixtures feature multiple levels to showcase your merchandise at more than one height. 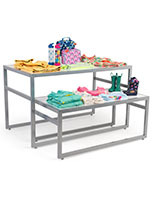 Each 3-tier store display table can offer approximately 29ft2 of space to hold your merchandise, while only taking up a 4' x 4' area on your sales floor. 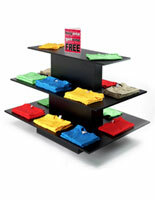 Pair this clothing display with differing store fixtures for a diverse look in your merchandising. 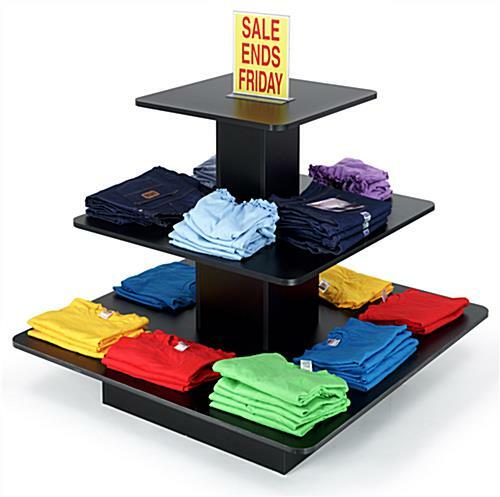 Buy display tables to feature jeans, t shirts, or other folded items. 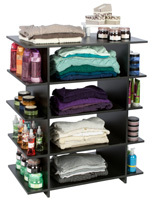 You can also use your fixtures to showcase accessories, perfumes, lotions, etc. 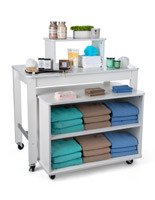 These store units are made with an easy to clean melamine laminate surface. Melamine laminate is thicker than vinyl laminate and provides a hard, durable surface. Your colorful apparel will stand out against the black display tables resulting in a really eye-catching display to draw your customers. 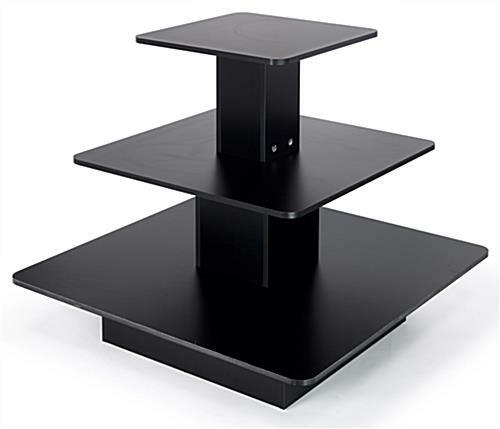 Please Note: These display tables do not arrive assembled. A clear instruction sheet is included. 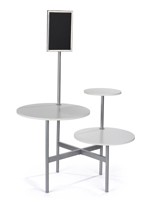 This is a large display unit, and 2 people are required for assembly. 48.0" x 42.0" x 48.0"
Our public library purchased two of these display tables for our Children's Department, and they are wonderful! Perfect height between shelves for even picture books to be displayed. We are very pleased with this purchase! Thanks for the feedback, Dena! We appreciate you taking the time to write the review and are happy that you're pleased with your order. Feel free to like us on Facebook and share a photo of your display table in action at the library! We look forward to hopefully working with you in the future. 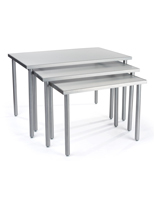 I bought this table for t-shirts in my store. It is very heavy and you need a couple people helping you put it together. Instructions were a little bit confusing..but not bad. When together, it looks great but does take up a lot of space. Make sure you have the room for it! I highly recommend!